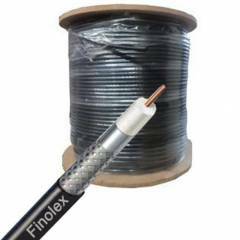 Finolex Coaxial Cables with electrolytic grade solid bare copper conductor. Gas injected physical polyethelene foam insulation with laminated aluminium tape and all Wire braid. Jelly flooded and PVC Jacketing in Black colour.